The school system in Scarborough has seen many changes over the past 352 years. In order to demonstrate to you how far we have come in education, Scarborough Middle School students invite you to travel back in time to witness the evolution of a variety of things found in any Scarborough classroom today. Today, students are regularly tested from kindergarten up until high school (as well as college if attended.) The tests are taken by the entire class at one time, quietly, and on paper or on the computer. There are no longer tests which determine admittance to high school, but the PSAT’s, SAT’s, and various others are important for students trying to get accepted into college. Scarborough teachers have changed greatly over the past years. The first school committee hired the town its first school master in March 1730. This school master taught alternately ¼ of the time at Black Point and then at Dunstan. In 1735 the town hired another school master, Robert Bailey. He was paid in lumber, a common form of pay at the time. 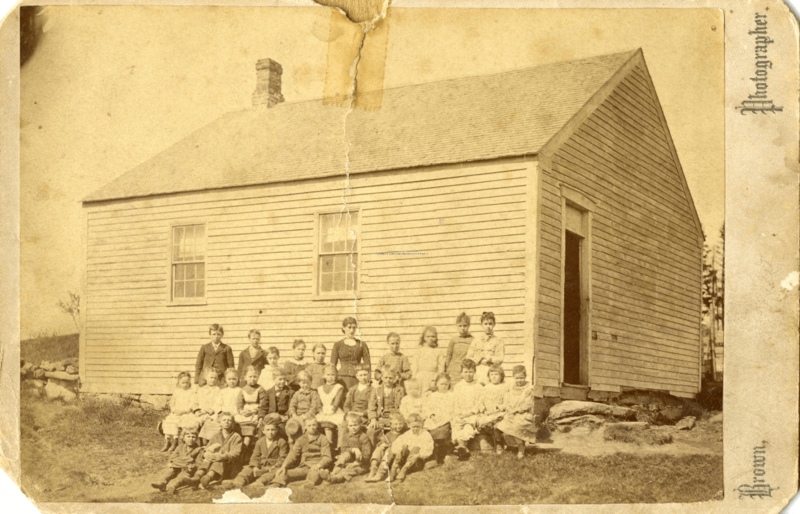 By that time the school had one official school, this was in the Prouts Neck section of Black Point. Scarborough had difficulty attracting teachers, because of its rural wilderness. But by 1846 Maine State Legislature set up a Board of Education that paid the teachers’ salaries from common taxes and helped attract teachers. In the 19th century the sole classroom teacher was usually an unmarried young woman, sometimes with students even older than herself. She would use the most basic resources, slate, chalk, and a few books. With these resources she would teach literacy, penmanship, arithmetic, and “good manners”, with recitation, drilling, and oral quizzes. Most teachers rotated living with local families. As time went on schools required more teachers, and in 1877 Edmund Fogg taught a class of about 30 students at Scarborough High School. One year later another teacher, William G. Lord, was hired at the high school and was often praised for his ability to teach. With more students and more teachers the school system kept growing larger and larger. And now the approximately 75 teachers at Scarborough High School require special training and a degree. Now there are more subjects, which require more teachers, and different, more varied teaching methods. Furniture in schools has changed much over time. In early schools, the students sat on three legged stools or long benches at narrow tables. These stools and tables were often made out of pine or oak boards by the students’ parents. By 1880, children sat in individual desks that were bolted to the floor, all facing towards the front of the room, and the teacher. Girls and boys sat on separate sides and the younger smaller children sat towards the front of the room, with the older larger children in back. Students rarely faced each other and had little interaction. By 1930, most desks were portable, but were still used in the same way as the old desks and tables. However, in the 1960s, round tables became common to encourage students to work together. Today, portable desks and tables are common in schools. Interaction among students is expected and the teacher no longer is the center of attention, the learning is. Blackboards have evolved over the years but their function is still a part of many schools today. The first blackboard was used in a Philadelphia school in 1809. These early blackboards were made of pine and coated with a mixture of egg whites and carbon from charred potatoes. The students and teachers wrote on the boards with chunks of chalk and erased with cloth rags. Soon, the slate board was invented and it was then that teachers switched to cylinders of soft white chalk -closer to what we have now- and felt erasers. These were easier to make, so instead of just one board in the classroom, each child was given their own. This made it a lot easier for teachers to teach their students because after she taught a lesson the students could practice it on their own. Chalkboards, as they were called because they came in green, continued to be found on the walls of many classrooms for many years. These boards have progressed all the way to current day where we use whiteboards also know as dry-erase boards. These are much easier to write on and erase. They allow for colored markers, but still require felt erasers. Teachers use them everyday to write down assignments, correct homework, and teach new topics. White boards have become a big part of the school day and are an important tool in learning. Some classrooms even have SMART boards, interactive whiteboards that combine a whiteboard with a computer. This entry was posted in Black Point, Dunstan, Schools and tagged Edmund Fogg, Robert Bailey, William G. Lord. Bookmark the permalink.